Each year about 3.500 children in Russia are diagnosed with cancer. Thanks to modern treatment methods 80% of them can be fully cured. But illness doesn’t go away without leaving a trace. Psychological trauma from longterm isolation in hospital, physical pain and decease of other children with illness leaves a mark on a child. It is very difficult to go back to normal life without qualified support, that’s why effective recreation programmes are crucial for children who had suffered from serious illnesses. Sheredar Foundation was established in 2012. The work of our foundation is fully dedicated to development of children’s recreation in Russia. The name Sheredar comes from the river adjacent to the camp in Sosnovy Bor village near Vladimir. In May 2015 the Sheredar rehabilitation centre for children was opened there. The centre is a unique space fully equipped and safe for children with any physical limitations. All our programmes aim to restore children’s confidence in themselves and the world around them within a short time. We want to show every child that he can do so much more than he has got used to thinking while being ill. To do so, at Sheredar we practice methods which proved to be effective at recreation camps all over the world. Our specialists regularly exchange expertise with the colleagues from Hungarian camp Bátor Tábor. Our volunteers are regular participants of SeriousFun Children's Network programmes. We know that the treatment of cancerous diseases leaves families drained not only of energy but also of money. Therefore participation in our programmes is completely free of charge for all children from all over Russia. You can view the schedule of upcoming programmes in the section «For Children and Parents» . 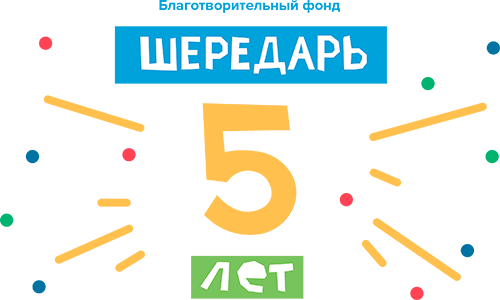 Sheredar Charitable Foundation is the only non-profit organisation in Russia so far that provides complex psychological and social recreation for children. Volunteers help us a lot at Sheredar programmes, and this is why development of volunteer movement in Russia is one of our goals. Before every session our specialists give volunteers a special training which consists of intensive learning of the basics of developmental psychology, methods of psychosocial rehabilitation and the intricacies of teamwork. This training will be useful not only for people who work with children, but also for everyone who wants to learn more about efficient communication, teamwork and charity. Sheredar Foundation holds international conferences and seminars about current issues of children’s recreation after serious illnesses. Specialists from all over Russia, as well as international experts in therapeutic recreation come to share their experience and learn from the colleagues. donate and give a child a ticket to a new life. Let’s help children forget about illness and feel joy of life again!